Below is the transcript of Monday night’s presidential debate at Lynn University in Boca Raton, Fla.SCHIEFFER: Good evening from the campus of Lynn University here in Boca Raton, Florida. 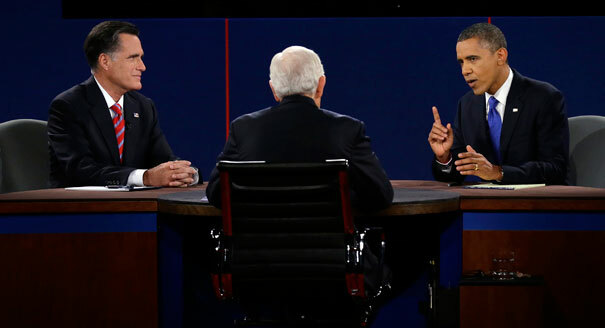 This is the fourth and last debate of the 2012 campaign, brought to you by the Commission on Presidential Debates.This one’s on foreign policy. I’m Bob Schieffer of CBS News. The questions are mine, and I have not shared them with the candidates or their aides.The audience has taken a vow of silence — no applause, no reaction of any kind, except right now when we welcome President Barack Obama and Governor Mitt Romney. (APPLAUSE)Gentlemen, your campaigns have agreed to certain rules and they are simple. They’ve asked me to divide the evening into segments. I’ll pose a question at the beginning of each segment. You will each have two minutes to respond and then we will have a general discussion until we move to the next segment.Tonight’s debate, as both of you know, comes on the 50th anniversary of the night that President Kennedy told the world that the Soviet Union had installed nuclear missiles in Cuba, perhaps the closest we’ve ever come to nuclear war. And it is a sobering reminder that every president faces at some point an unexpected threat to our national security from abroad.